Andrew Earle Simpson was commissioned to write a chamber music in response to an art exhibit at the Cedar Rapids Museum of Art called Art in Roman Life: Villa to Grave. 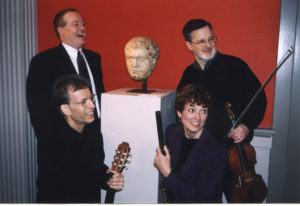 Simpson’s musical work titled Tesserae: Six Mosaics of Ancient Rome was premiered in April, 2004 in a Roman Villa constructed in the gallery of the Cedar Rapids Museum of Art. Andrew Simpson’s Tesserae: Six Mosaics of Ancient Rome was commissioned by the Cedar Rapids Museum of Art with support from the American Composers Forum and the Museum Loan Network. This project is called Rome or Bust ___ Simpson’s music is inspired by three Roman busts from the museum’s collection. The project was sponsored by the D.C. Taylor Company with additional support form the American Composer’s Forum, the Museum Loan Network and The Gazette. Special thanks for this extended collaboration goes to Cedar Rapids Museum of Art curator Jane Milosch, Executive Director Terence Pitts, Education Director Suanne Huffman, and the museum staff. 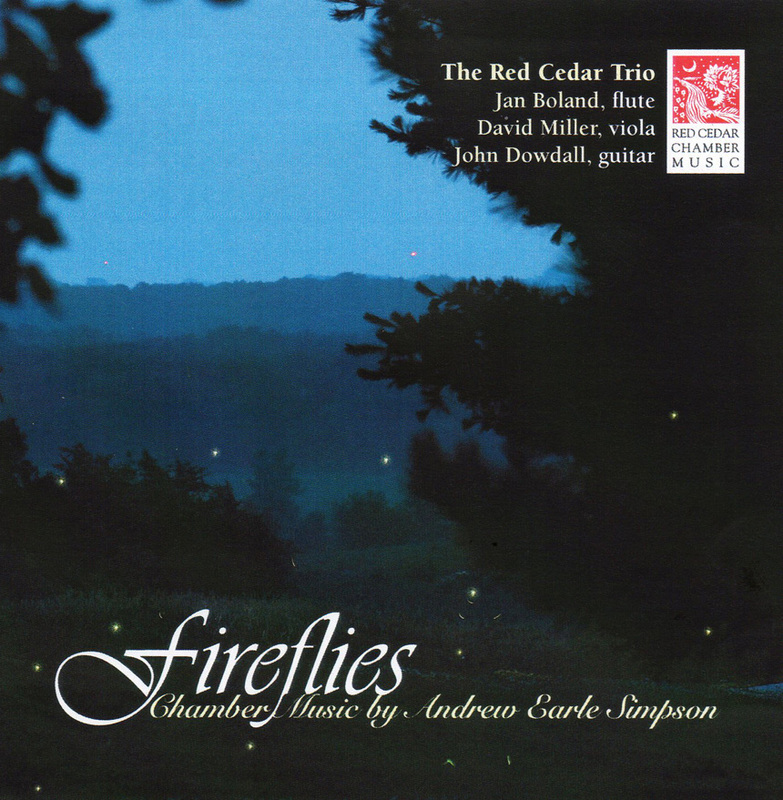 Simpson’s Tesserae: Six Mosaics of Ancient Rome was recorded to compact disc by Jan Boland, John Dowdall and David Miller on a disc devoted to the chamber music of Andrew Earle Simpson and titled Fireflies. The disc is released by Fleur de Son Classics (NY) and distributed by Naxos of America. • Feb 2-13, 2004 Two-week residency at Polk Elementary School in Cedar Rapids featuring Tesserae by Andrew Early Simpson. • April 14, 2004 Educational event Rome or Bust!. • April 14, 2004 Buck Creek Methodist Church, Buck Creek, IA. • April 15, 2004 Starlighters Theater in Anamosa, IA. • April 16-17, 2004 Main-Stage Concert at the Cedar Rapids Museum of Art, Cedar Rapids, IA. Rome or Bust! • April 17, 2004 Cedar Rapids Museum of Art, Cedar Rapids, IA. Rome or Bust! • October 3, 2009 Concert at Catholic University in Washington D.C.
• October 4, 2009 Concert at Walters Art Museum in Baltimore, MD. 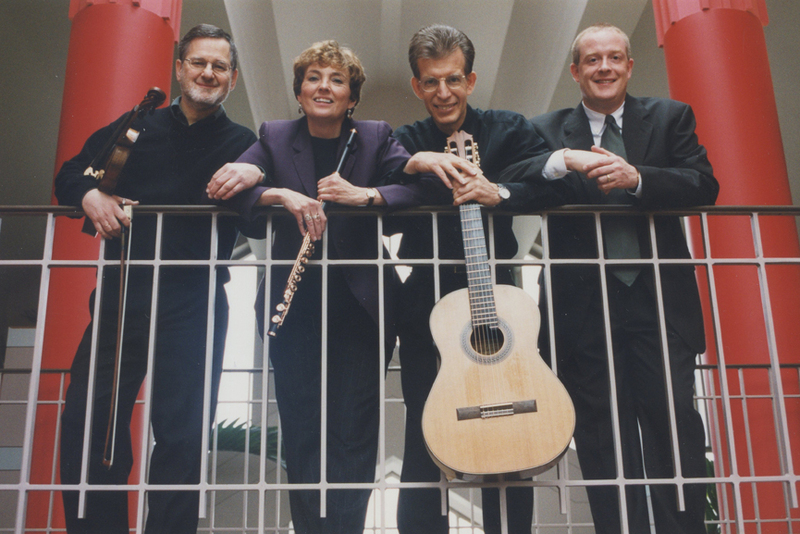 John Dowdall, Jan Boland, Jane Milosch, Andrew Simpson and David Miller at the Cedar Rapids Museum of Art. “As always, this was a delightful concert – light, diversified, melodic. I especially found the insights to “Tesserae” so very helpful. It made listening to the music so very enjoyable. As musicians, you are spectacular. Thank you. Jan, you make playing the flute look so simple and graceful.” B.C. “I consider you all excellent musicians. This was a particularly intriguing program.” M.M. “Enjoyed the concert immensely.” J.C.
“What struck me while listening to Mr. Simpson’s new work was what a difference it makes to have it played by first class musicians, like yourselves. In the hands of masters, it came off just as the composer intended. I really appreciated the insights prior to performance of that piece.” G.S.